Ajit Pai, the FCC, and the populist war on Obama's regulators. 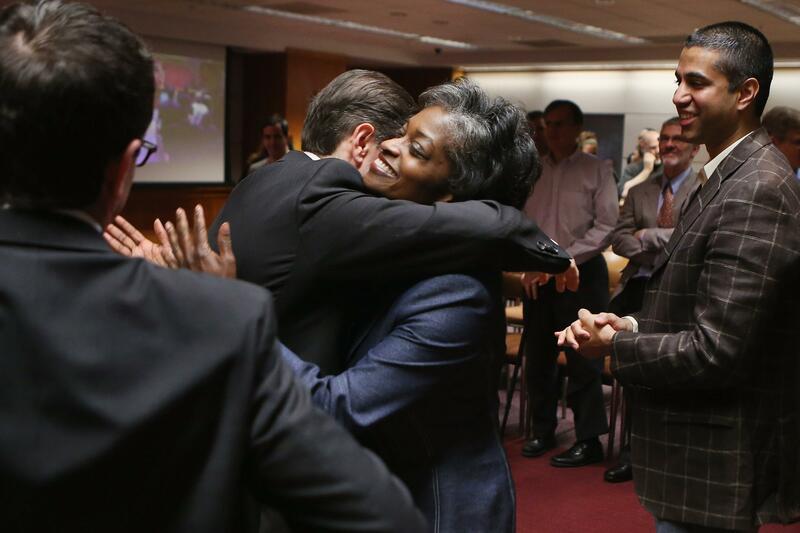 FCC Chairman Julius Genachowski embraces fellow Commissioners Mignon Clyburn, center, and Ajit Pai, right, after he announced he is stepping down at FCC headquarters on March 22, 2013. Since then, Pai hasn’t embraced everything about his new employer. If you ever doubted that an op-ed can change the world—a terrifying thought, to lose that power—get to know Ajit Pai. Appointed to the FCC in 2012, one of the Republicans nominated by Barack Obama, Pai grew disturbed by the organization’s year-old Multi-Market Study of Critical Information Needs. As described by Pai, the project would snoop around newsrooms, making sure they adhered to political correctness though a series of codewords—“eight categories of ‘critical information’ such as the ‘environment’ and ‘economic opportunities.’ ” Anyone could tell what this was: the return of the Fairness Doctrine. Eleven days after the op-ed ran, and the same day as Pai’s interview on CNN, the FCC suspended the study while issuing a statement defending the theory behind it. A week later, the FCC officially announced that it wouldn’t even try to conduct the study. Good timing: By then, Fox News was reporting on how the journalism schools received funding from George Soros. What more needed to be said? The devil’s hands were all over this thing. In isolation, the campaign to stop the FCC study would be interesting. But it wasn’t isolated. At the same time that conservatives were hammering the study, they were soliciting public comments against proposed IRS rules to limit the activity of nonprofits in the 60 days before elections. FreedomWorks, Ron Paul’s Campaign for Liberty, and multiple members of Congress pressed their activists (or constituents) to add public comments. The result: almost 140,000 public comments, most of which will surely oppose the rule.